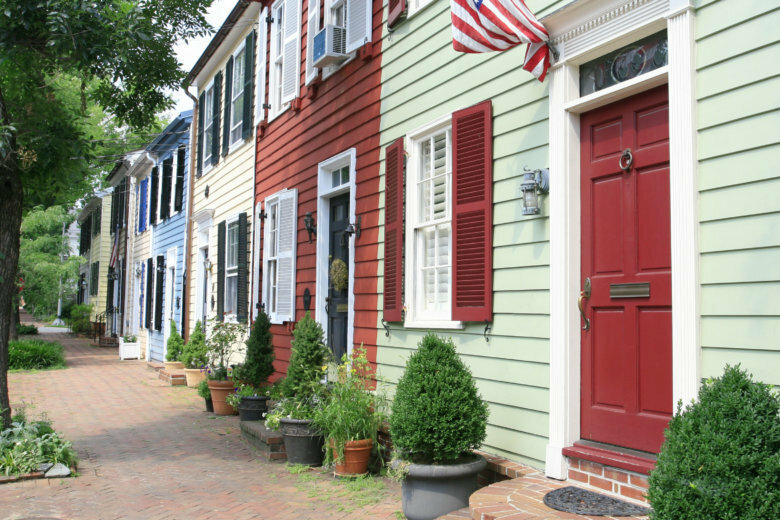 City street in Old Town, Alexandria, VA.
Home sales rose 5.4 percent in December compared to a year ago, buoyed by a 28 percent year-over-year increase in both Arlington and Alexandria. “The buzz HQ2 has created will definitely impact our market for years," one realtor says. WASHINGTON — The Northern Virginia Association of Realtors said its realtor members sold 22,140 homes in 2018, nearly matching the 22,555 home sold in 2017, which was the highest number of sales since 2005. Total sales volume last year in Northern Virginia was $13.1 billion, just above total sales volume in 2017. The Northern Virginia Association of Realtors footprint covers sales activity in Fairfax and Arlington Counties, the cities of Alexandria, Fairfax and Falls Church, and the towns of Vienna, Herndon and Clifton. Speaking to a group of regional real estate leaders on Jan. 10, National Association of Realtors chief economist Lawrence Yun touted Northern Virginia’s status as a tech hub to reinforce his long-term solid growth forecast for the area’s housing. But in the near-term, Yun said tax reform, lagging consumer confidence, the government shutdown and economic uncertainty are keeping home sales flat nationwide. Even so, year-end total 2018 home sales in the NVAR region were just 2 percent below 2017 levels. The anticipated arrival of Amazon’s HQ2 may be sparking investor speculation. Home sales rose 5.4 percent in December compared to a year ago, buoyed by a 28 percent year-over-year increase in both Arlington and Alexandria. “The buzz HQ2 has created will definitely impact our market for years,” said NVAR board member Reggie Copeland with C.R. Copeland Real Estate in Fairfax. Contracts signed to buy in Northern Virginia, which may include deals with pending contingencies, were up 73.75 percent compared to December 2017. There continues to be less for potential buyers to look at. Active listings in Northern Virginia were down 20 percent from December 2017. “The difference is felt when you’re showing properties and you’re only able to show them one or two homes per showing, and they don’t have a lot of time to think about it,” Copeland said. The average price of a home sold in Northern Virginia in December was $593,400, compared to $591,005 a year ago.